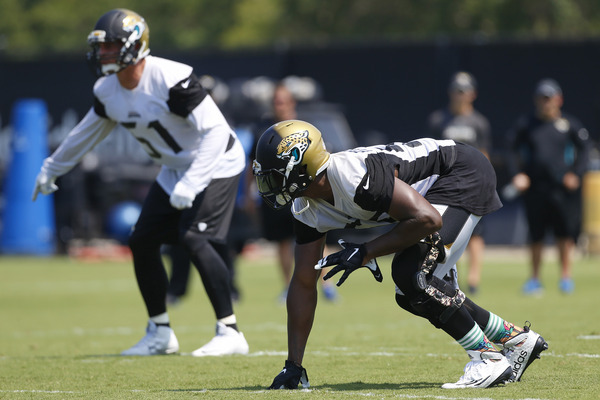 Jacksonville Jaguars defensive end Dante Fowler (56) lines up during minicamp workouts. The Jacksonville Jaguars are getting their first extended look at 2015 first-round pick Dante Fowler, and the early reviews describe last year’s third overall pick as a burgeoning star. He’s healthy now and destroying people at Jaguars training camp. While Fowler says his knee is 100 percent, he’s not convinced all his explosiveness is back. When it all comes back, the Jaguars might have a scary pass-rusher to lead their young, talented defense. It took a year delay, but the Jaguars are finally getting to see the full potential of their 2015 first-round pick. Mark Fowler down as one of the players with serious breakout potential in 2016.